The castle above is Methoni on the west coast of the Peloponnese. 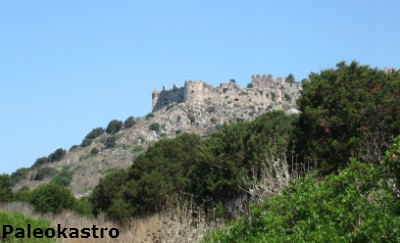 Paleokastro or Palionavarino is a medieval castle and an ancient acropolis, on top of a steep cliff overlooking the Gialova lagoon, on the north side of the bay of Navarino. It is a naturally defensible site which has probably been occupied since classical times. 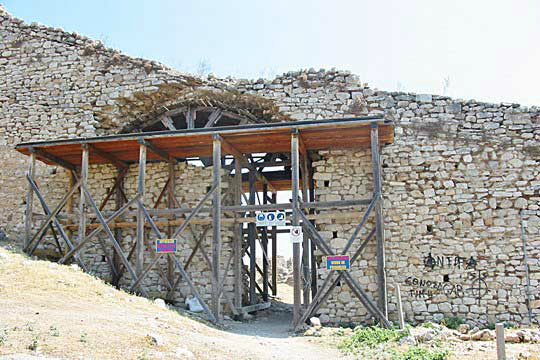 Although there are no physical barriers to access, the castle ruins have been declared "closed" because the structure is considered dangerous. Its shape is a trapezoid with a total area about 50,000 sq m. The walls and many of its towers are still standing but inside there are only ruins. The interior of the castle is divided by a transverse wall in two parts. The north part, which is at the top, is the location of the ancient acropolis and maybe the location of the original Frankish castle. The south yard was added much later by the Venetians or the Turks. On the east side there are no walls, as the natural fortification of the rock gave ample protection. The present form of the castle is the result of the final changes in the late 16th century. 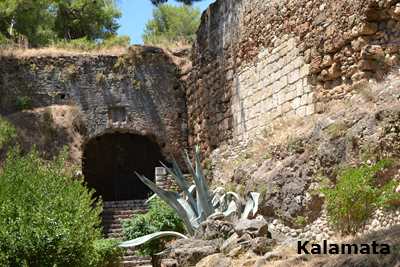 Below the walls of the castle there is the so called "cave of Nestor". 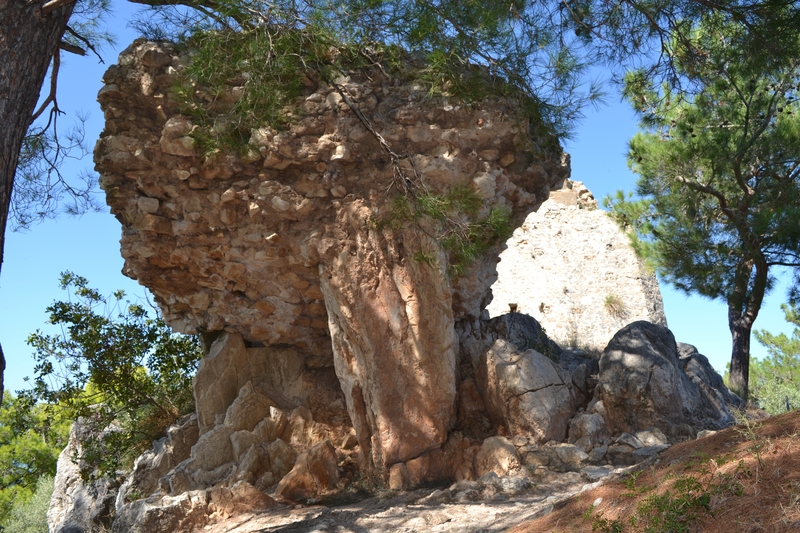 According to the Greek Mythology, Hermes stole cows from the god Apollo and hid them in this cave. On 20th October 1827 during the Greek War for Independence, Paleokastro took part in one of the most important naval battles in world history, the battle of Navarino. A combined Turkish and Egyptian armada was destroyed by an allied British, French, and Russian naval force. The Turkish canons were shooting against the ships of the European allies from Paleokastro as well as from Niokastro but within hours the Europeans' superior artillery completely annihilated the Turkish and Egyptian fleets. The Turkish defeat was so complete that in 1828, they began to evacuate Greece, and in 1832 Greece won its independence after nearly 400 years of Turkish rule. 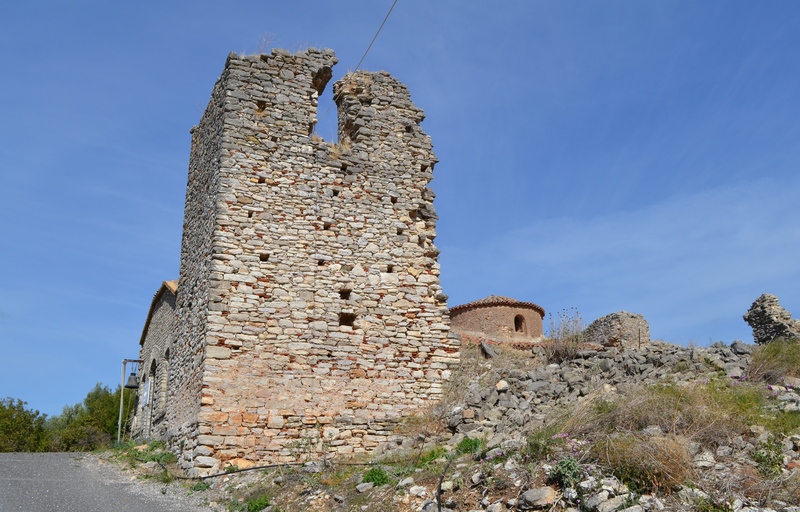 The Castle is Byzantine built around the 11th century, sited on top of a steep hill above the north-west end of the Old (Upper) Town of Kyparissia, probably at the location of the ancient Mycenean acropolis of Cyparissia. 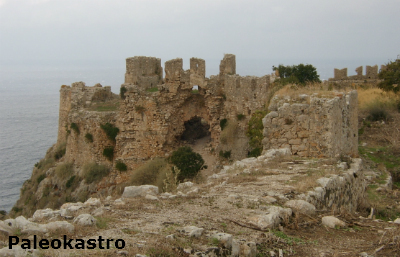 The Castle of Kyparissia is also known as the Castle of Arcadia, which is the medieval name of the town as numerous Arcadians moved there. 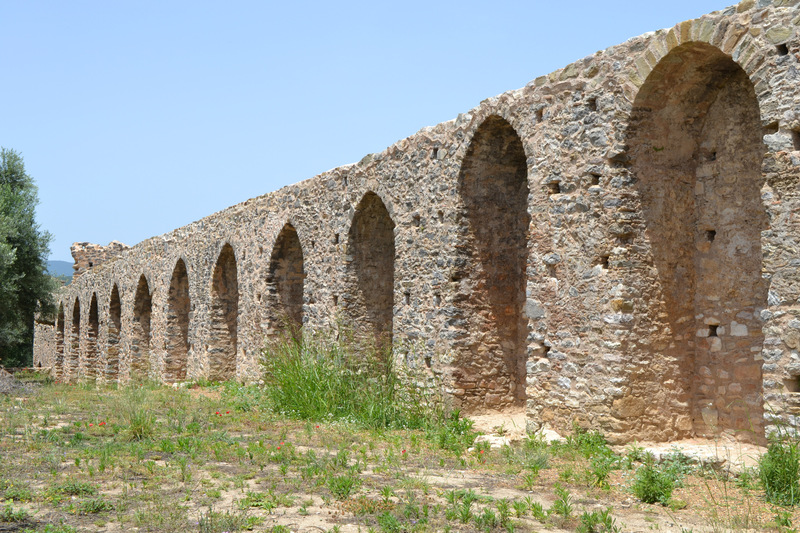 In mythology the citadel of Kyparissia was built by "Giants". Some of the stones with which the castle is built are enormous, some are 4m in length and 1.64m wide, others are 1.38m long and 1.80m wide. 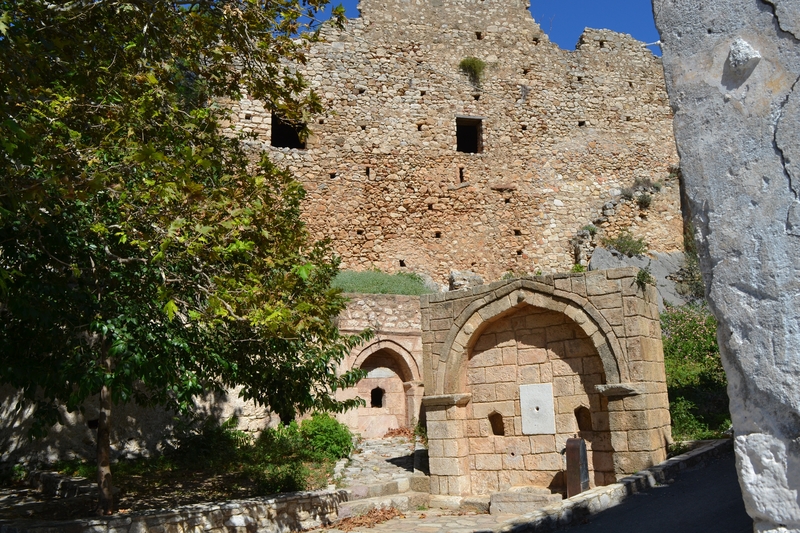 Four walls were built at the four corners of the castle by the Byzantines, but only one is preserved today, which is named "Ioustinianos", after the great Byzantine emperor. 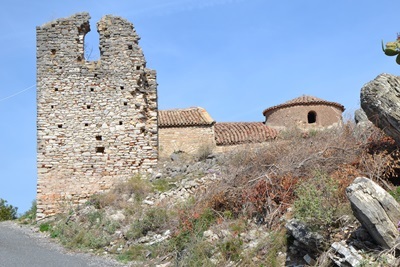 During the first decades of the 13th century, the castle fell to the Franks who renovated it then it remained in their hands for the next 2 centuries. In the following centuries the castle of Kyparissia had suffered a great deal of destruction and reconstructions by its conquerors, the Turks and Venetians. 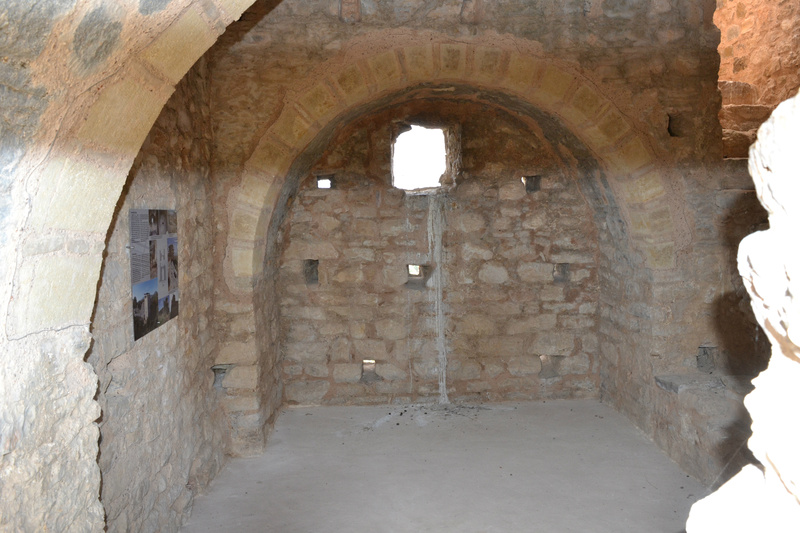 Evidence of the Ottoman influence is the square building next to the ruined gate of the inner enclosure which has been identified as a mosque. 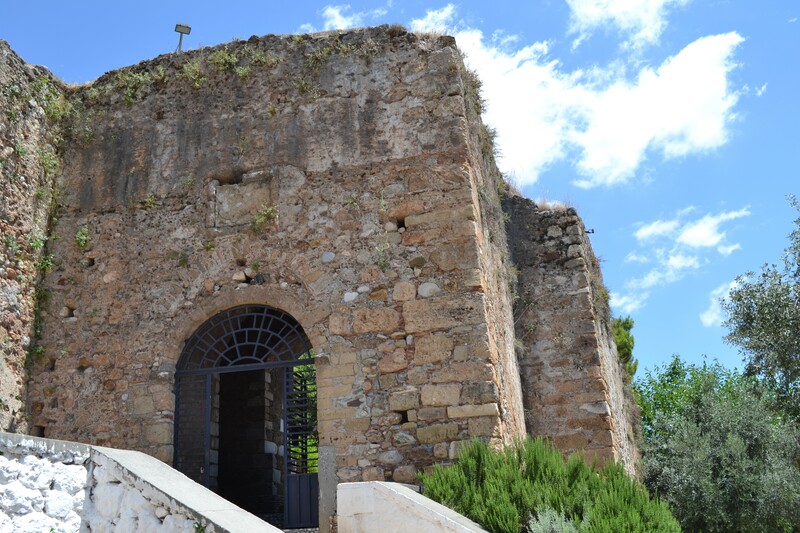 In 1460, the Castle of Kyparissia was conquered by the Turks who held it until the Greek War of Independence in the 1820's. The castle was seriously damaged during this war. 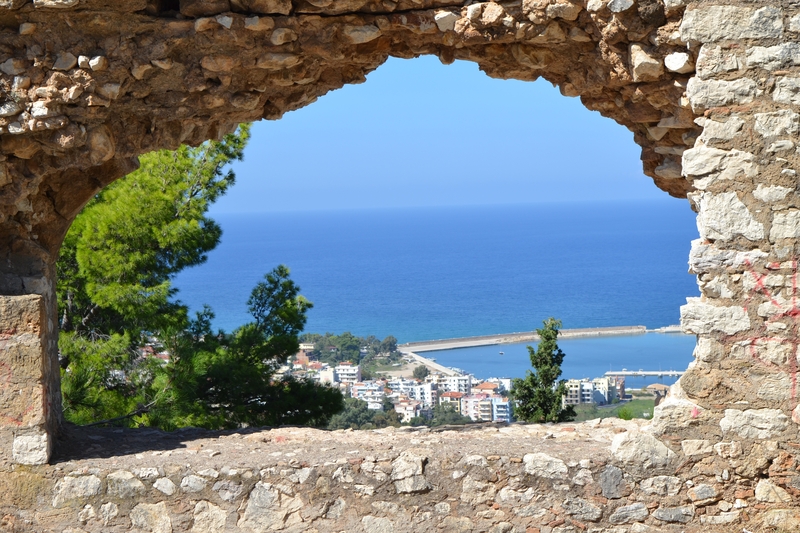 Over the centuries, the castle of Kyparissia has stood above the town , offering vistors not only a spectacular view of the town, but also the whole of Kyparissia Bay. 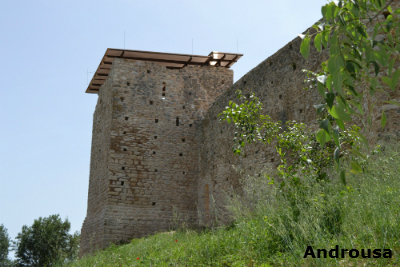 The castle of Kalamata stands on a low rocky hill to the north- west of the city above the Nedonatas river. 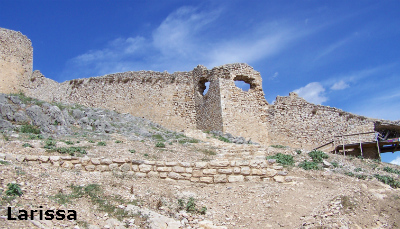 An ancient acropolis existed on the hill before the Trojan war, and later a Byzantine fortress, but the ruins we see today are the remains of the castle that was rebuilt there at the beginning of the 13th century, during the Frankish occupation. 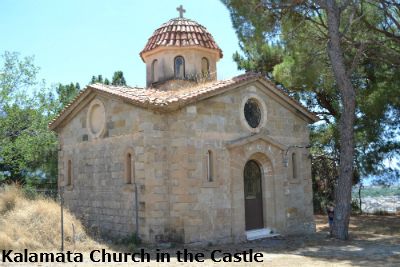 In the 6th century AD a church was built in the castle devoted to the Virgin Mary. An icon of Virgin Mary in the church became famous as 'Kalomata' (meaning 'beautiful eyes'). 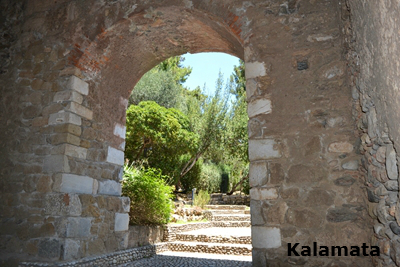 This later changed to 'Kalamata' which became the name of the church, the castle and the city. The ancient acropolis on the rock was founded by the mythological Faris from Argos. The city was named Farai or Fares and is mentioned in the Iliad as one of the seven cities that Agamemnon offered to Achilles to ease his anger. Fares never became an important city in the ancient world and archaeological excavations have proved that the city was on the hill and not in the surrounding area. 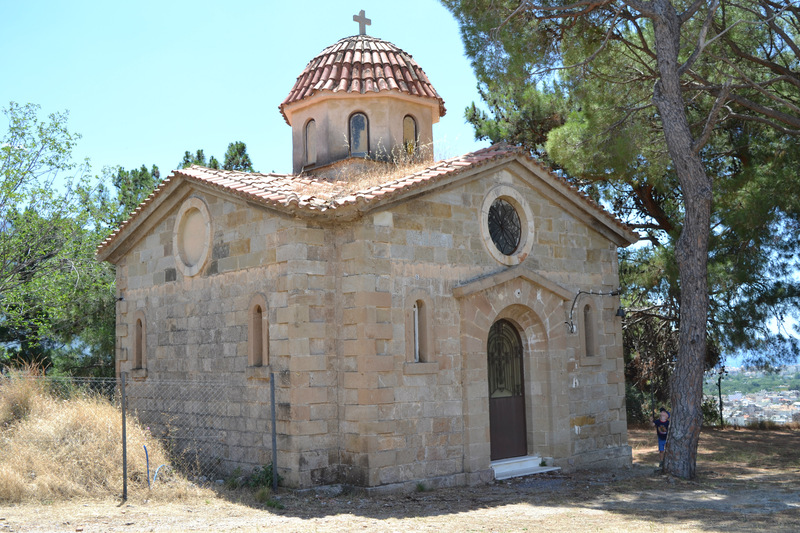 It was inhabited during the early and middle Byzantine period but its growth started during the Frankish occupation. Guillaume II de Villehardouin who later became the most notable ruler of the Principality (1246-1278) was born in the castle of Kalamata. 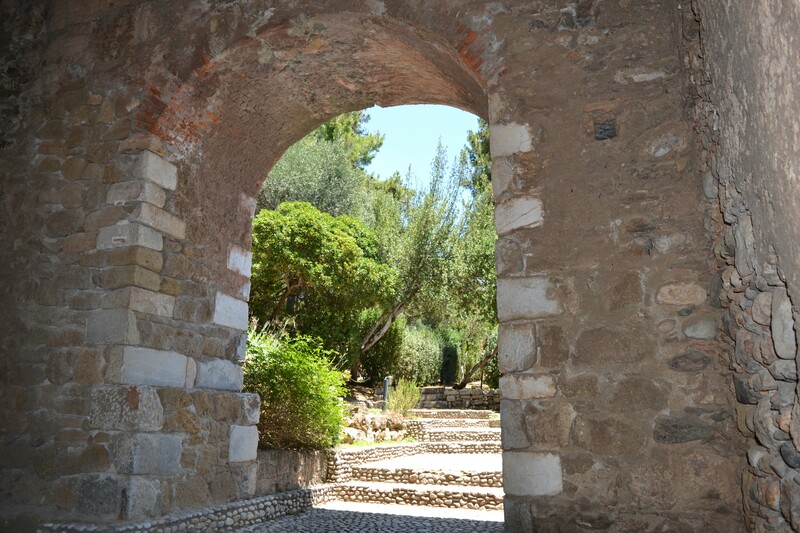 Over the years the castle was occupied at various times by the Venetians, the Franks and the Turks. 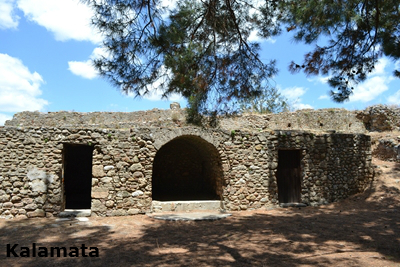 At the top of the hill, there is a tower shelter with a vaulted water reservoir where the ruins of a temple have been found. An inner fortification wall surrounds the top of the hill and there is a second wider one. 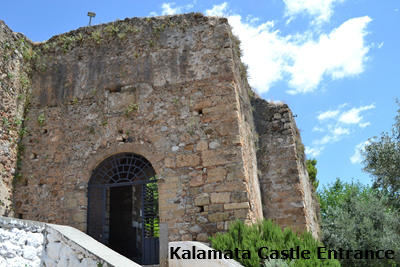 During the 18th century, although the city of Kalamata expanded, the castle was gradually abandoned and ruined. 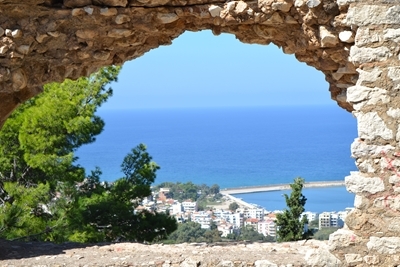 Kalamata was liberated on 23rd March 1821, in the first act of the Greek War of Independence. Inside the castle there is an amphitheatre with a permanent stage. 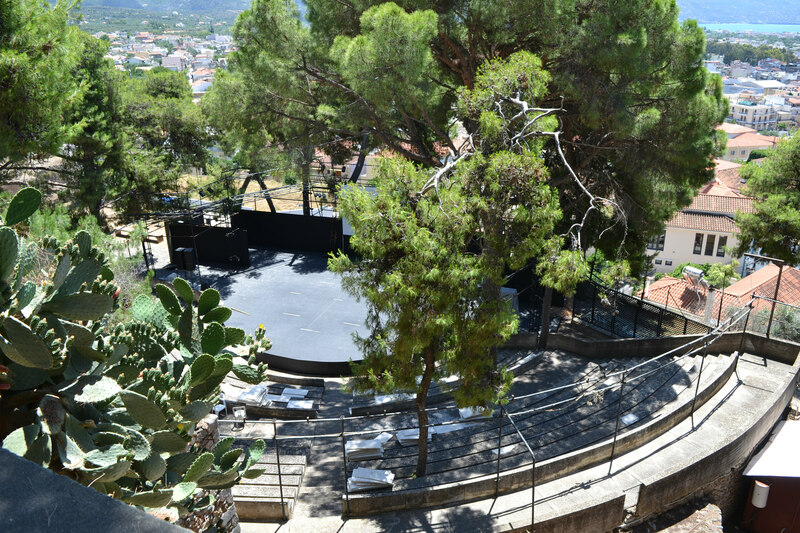 During the summer a classic play of the Municipal Theatre of Kalamata is presented in this amphitheatre. During the earthquake of 1986 the castle was badly damaged and many parts were listed as dangerous. The site has now been renovated and has been open to the public since 2010. An entry fee of 2 euros is charged (1 euro for seniors). 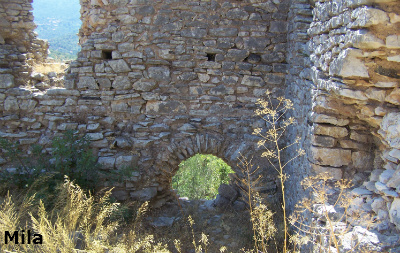 Mila is a medieval castle north of the village of Mila in Messinia. 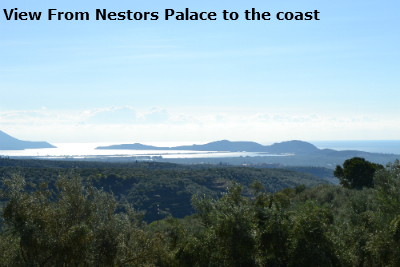 It is at a strategic location for the control of the north plain of Messinia and can be clearly seen from the road from Tsakona to Kyparissia . 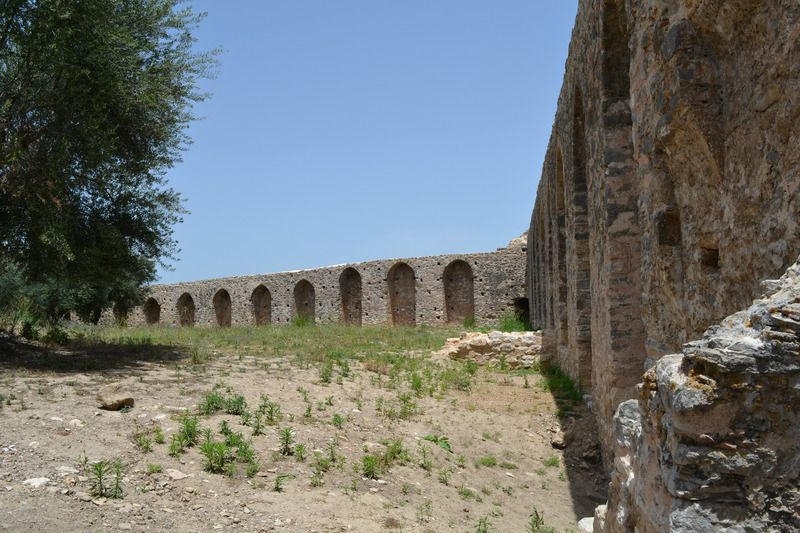 It was built during the Frankish rule in the Peloponnese during the 12th century to protect the residents of the area and control the mountain passes to Arcadia. 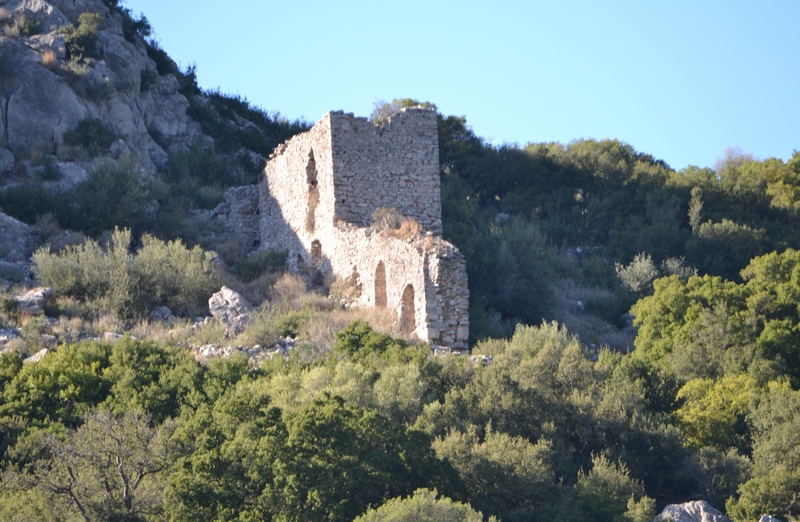 This was most likely the Chateaunef castle that the Frankish Princess of Morea Isabelle Villehardouin (1297-1301) founded in order to repel the attacks of the Byzantines of the Despotate of Mystras. 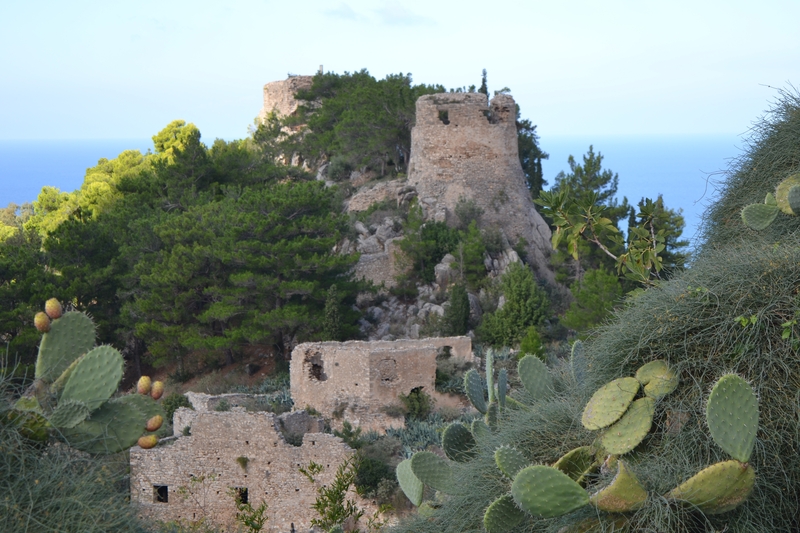 The castle is not easily accessible, as when we visited we parked near the village and walked up the hill to it. The site is very overgrown and it is quite difficult to get around the outside and the inside of the castle. However, it was well worth the effort. Larissa is one of the ancient castles of Greece. The site was fortified since prehistoric times and remained a powerful fortress through the classical period and the Middle Ages until the 19th century. To the north of the town of Argos, there are two hills, one is Aspis and the other Larissa, the taller of the two at 289m. 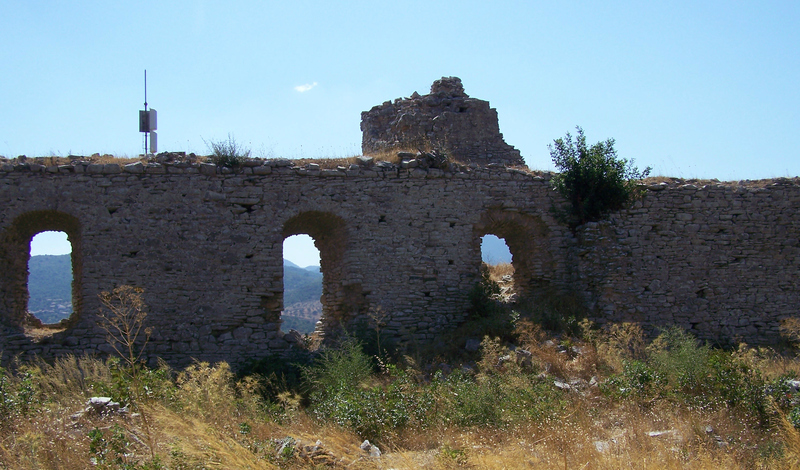 In antiquity, there was another castle on Aspis which did not survive. 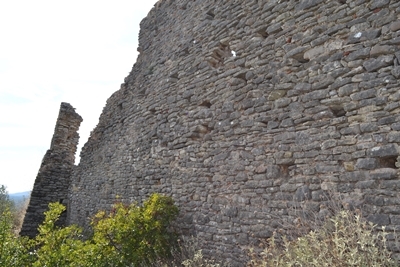 There was a wall between the two castles for the protection of the city from the north. A castle was built here in the 6th century BC. but there has been a fortification here since prehistoric times. 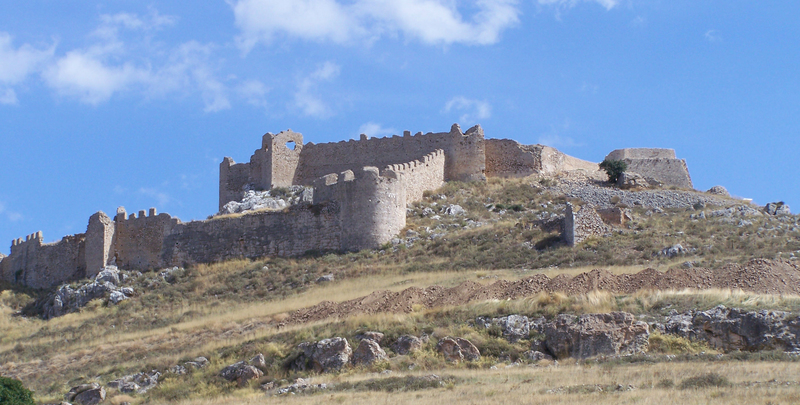 The medieval castle was first built by the Byzantines in the 10th century. 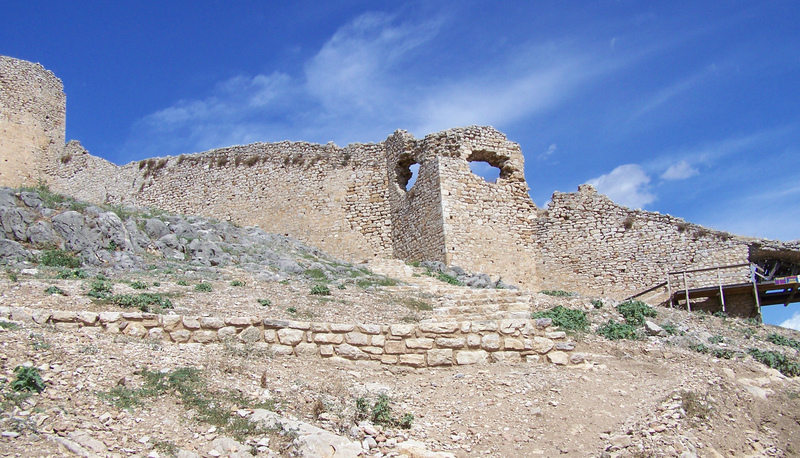 During the Byzantine period, the fortress was of strategic importance. In 1203, it came under the control of the archon of Nauplion, Leon Sgouros. In 1212 it was captured by Othon de la Roche, the Bourgoundian Duke of Athens, and was controlled by the Franks until 1388. Between 1394 and 1463 it was occupied by the Venetians. In 1463 it was captured by the Turks and remained under their control until 1822, interrupted during 1686-1715, when Larissa came under the control of the Venetian admiral Morozini. The site was liberated by the Greeks in 1822. 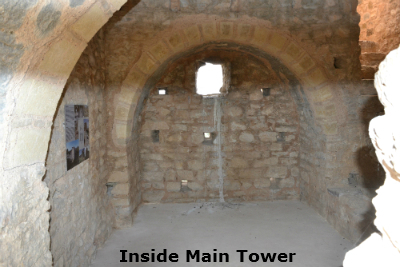 The inside of the castle was not accessible when I visited in February 2106 as there is a tremendous amount of renovation and archaeological work being undertaken. This photograph shows the renovations in progress. The drive up to the castle is very beautiful and the views are tremendous. Hopefully the castle will be open to the public in the near future. 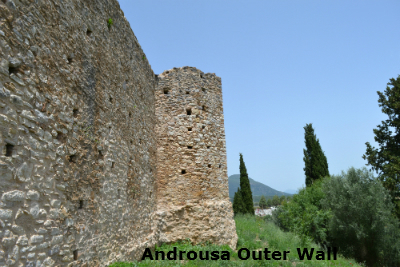 Androusa is a Frankish castle in the village of Androusa in Messenia 21km from Kalamata. 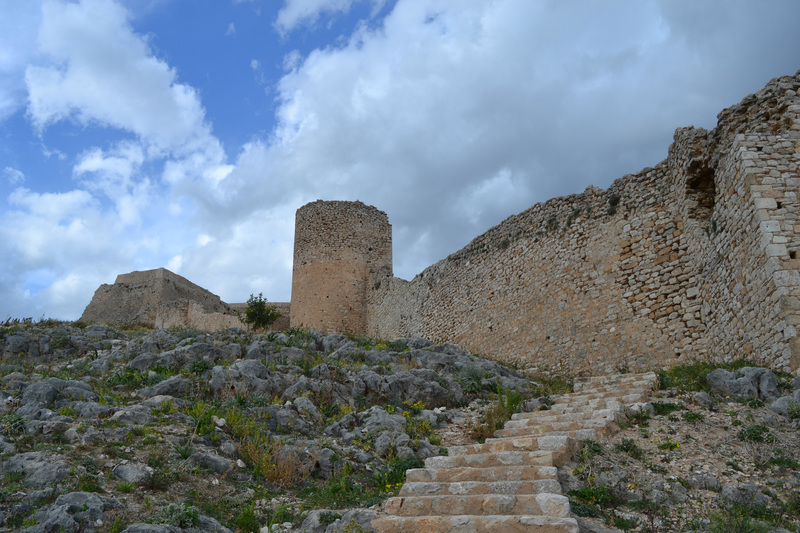 Around the end of the 14th century, it was one of the most important castles in Peloponnese. According to the Chronicle of Morea the castle of Androusa was constructed by the renowned Frankish ruler Guillame de Villehardoudin in the middle of the 13th century. 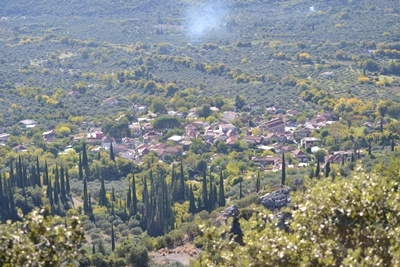 Documents which date from the period in the Principality of Achaia (1205 - 1428) mention Androusa as the seat of the military commander of the castellary of Kalamata. By the end of the 14th century the castle served as a stronghold of the Navaresse Company in Messinia. 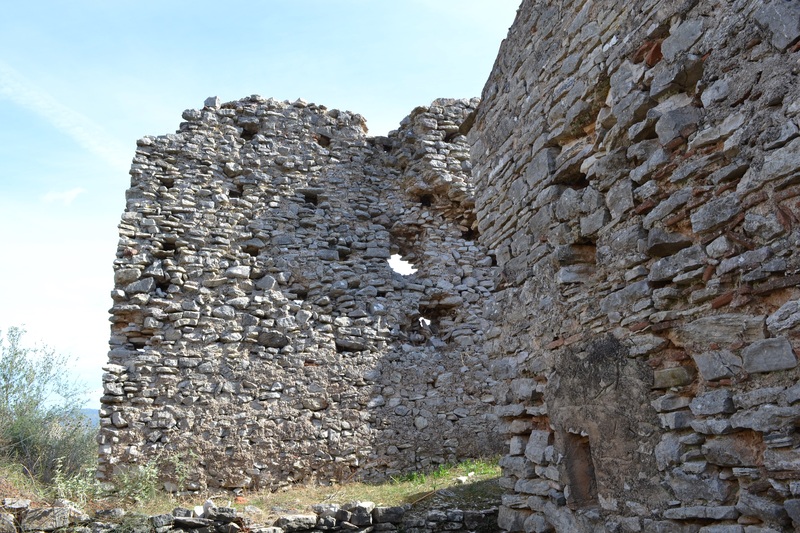 From 1417 Androusa remained under control of the Despots of Mystras for a few decades. Later it was conquered by the Ottomans, as was the rest of the Peloponnese. 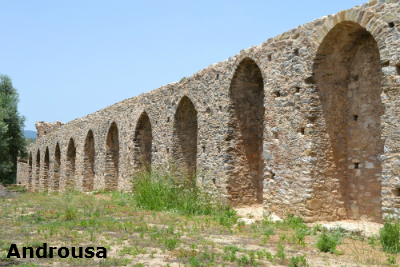 During the next centuries Androusa became a bishopric and emerged as an important administrative centre in Ottoman held Messinia. It was also the seat of an administrative district during the second period of Venetian rule (1685 - 1715). From the beginning of the 18th century the castle lay in ruins. The ground plan of the curtain wall, only a small part of which survives today, is trapezoidal and generally follows the contours of the terrain. Its northern and eastern sections are better preserved. They are articulated with a series of blind arcades, on which rested the rampart-walk of the castle. The arches of the arcades are pointed and some of them are embellished with elaborate decorative brickwork. The walls are reinforced at regular intervals with towers of various shapes. 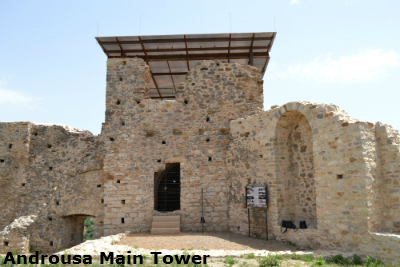 The huge tower rising on th southeastern corner probable served as a keep and it is the earliest defensive building of the castle. The walls and towers were added in a later phase. A large section of the eastern side probably dates back to the 14th C while the northern curtain wall and its towers seem to have been rebuilt during the 15th C. This reconstuction took place in order to reinforce the castle with the innovative defensive techniques of that era that included gunpowder artillery as is indicated by the existence of small cannon embrasures in the northeast, north and southwest towers. The project "Restoration of the eastern section of Androusa Castle walls", with a total budget of 550,000 euros was implemented by the Ephorate of Antiquities of Messinia via direct labour. The work commenced in April 2012 and was completed in October 2015. The restoration project included excavations for the uncovering of the curtain walls and towers, reconstruction of ruined sections of masonry, grout injections and pointing. Furthermore the walls and towers underwent waterproofing treatment and retaining walls have been built. Additionally in the northeast tower, the floors, the cistern and the interior staircase were restored. Finally a metal shelter covered with polycarbonate sheets was installed on the tower to ensure its protection. The Castle of Archangelos is a castle on a hill above the village Polichni, 10 km from Meligalas in Messinia. The location has been identified as the Archangel Castle, which, according to sources, is linked to the Acciaioli (Acasolioli) family of Florentine bankers. As the name Acciaioli appeared in the history of the Principality of Achaia in the middle of the 14th century, in that year the castle must have been established. 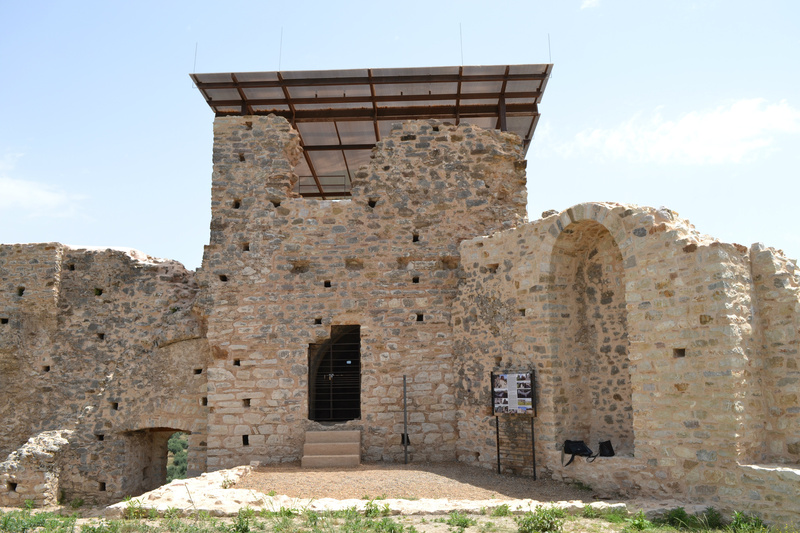 Because of the pre-existing Byzantine temple on the site, the Latins gave the castle the name of Archangel Michael. In 1418 it was reported that it was captured by the Byzantines of the Despotate of Mystras. 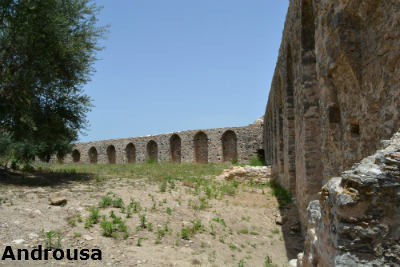 About 1460 it was occupied by the Turks and was used during the following centuries. The walls are built of small stones with blocks of bricks. The highest part of the wall, on which two building phases are discerned is preserved to the east. The southern side wall is severely destroyed and has an almost square tower adjacent to a two storey building. The western side of the wall has been completely destroyed. In aerial photographs, the line of the old castle walls are clearly seen, reaching low into the foot of the hill. It is noted that the tower is not like the usual defensive towers that exist in Greece, but a remnant of a normal castle. 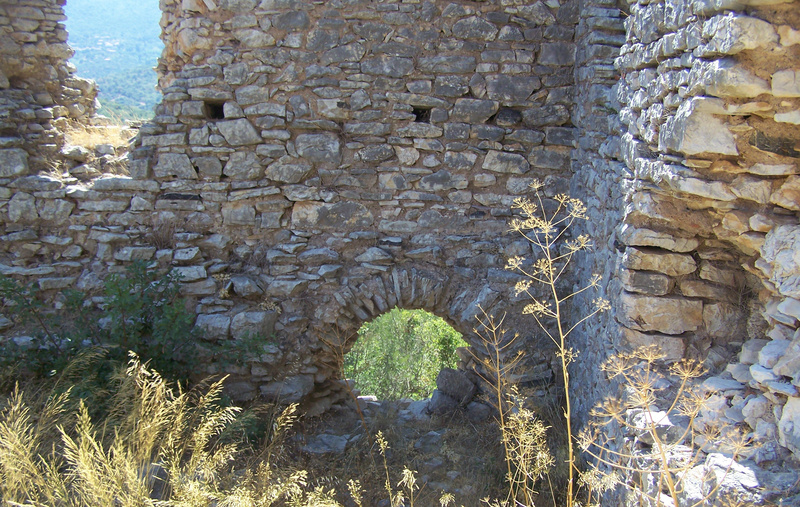 In the middle of the ruins of the castle is the church of Agii Taxiarches. 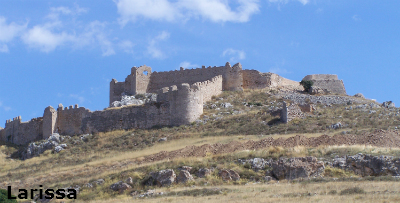 Named - Castle of Melpeia or Castle of Krebeni or Dimatra castle. The ruins of a Frankish settlement and castle on a hill northeast of Lower Melpia, Messinia. It dates back to the second half of the 13th century on the basis of archaeological and historical data. A wall section on the north side is preserved, while the remaining sides may have had no fortifications as they protected the steep rocks. It is a fortress complex from which ruins of walls, towers and buildings are preserved on an area of about 50 acres. Blind arches are formed on its surface, most likely for the rotor support. The other sides of the enclosure might not have been reinforced, as they were steep. Within it are many ruins of buildings, a cistern and a church. The inner enclosure, on a much higher level, occupied the northwest top of the rock. There are traces of the wall that protected it on the north side, while the rest are naturally steep. To the north is the square tower-retreat (acorn or donjon), while in the southeast there was a large rectangular building and an oval-shaped stern that is partly in the rock. This photograph is of the village of Melpeia taken about halfway up the mountain!! 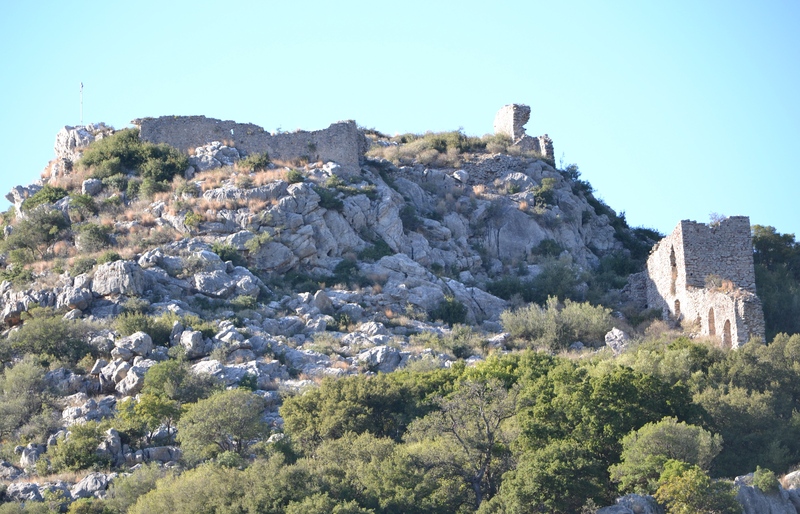 When I set off to visit Krebeni Castle, I parked the car at the bottom of a very rough track where the signs said - Waterfall 600m, Lakes 1km and Castle 2km so I thought that would be fairly easy. I found the little waterfalls and also the small lakes and carried on up the track towards the castle (following the sign). Now it was a very warm day and the track was 1:5 or even 1:4 in places, (i.e. very steep). I carried on climbing the track up the mountain and eventually I was on the same level as the castle. The only trouble was that I was on one mountain and the castle was on another. By now I had walked at least 5/6km and could see the track curving round way into the distance. By now it was about 3pm and I reckoned that I had at least another hour or more to walk before I got to the castle, time to look around it and take my photographs and then at least 2 hours to walk back down. Which would have meant coming down in the dark which was not a good idea - so I gave up (and I hate being beaten). So in the near future I will have another go and try to find out from the locals if there is a quicker way to the top!! The only photographs I took of the castle that day were with my telephoto lens.